Moist turkey ham topped with this sweet and spicy glaze makes a tempting entrÃ©e that is sure to please. 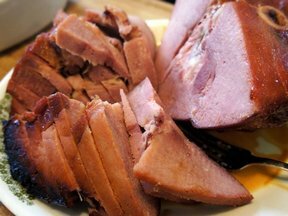 Lighten up your meal with this turkey ham recipe and still enjoy an abundance of flavor. In small sauce pan over medium heat, add pineapple juice and cornstarch. Stir constantly until mixture becomes thick. Stir in spicy mustard and marmalade. Remove from heat. Spoon 1/4 of the glaze into a separate bowl and set the remaining 3/4 aside. Score the turkey ham and place in prepared baking dish. 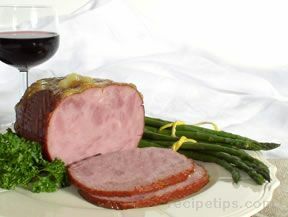 Glaze ham with prepared marmalade to lightly cover exposed sides of ham. Bake ham 15 minutes per pound, uncovered. While baking, baste 1 or 2 more times using the total of the 1/4 of glaze on the turkey ham. 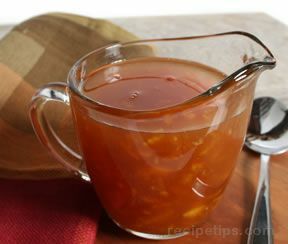 Add the drained pineapple chunks to the reserved glaze and pour over turkey ham slices when served. "This was easy and amazing!! My husband couldn't get enough!"